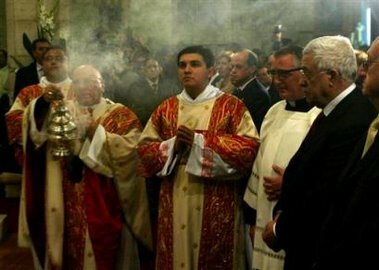 Mahmoud Abbas prays at the Catholic Midnight Mass in Bethlehem. Israel fears his time as Palestinian Leader is about to end. With 30,000 police under his control, Abbas is still not able to restrain radical groups from continuing their attacks on Israel or from threatening each other. Israeli military sources say that Palestinian Leader Mahmoud Abbas is at an all time low since taking over for Yasser Arafat in November 2004. Senior Israel Defense Forces officials and Shin Bet security service officials have said recently during internal discussions that Abbas is impotent to enforce his directives, especially on the security front. Abbas is barely on speaking terms with some security officials, and when he succeeds in issuing an order it is not implemented, they said. Even though there are nearly 30,000 men in arms under the PA’s banner, they have not been able to enforce their will on the Islamic Jihad and the other militant groups involved in launching the rockets. The Israeli officials attribute the continuing launches, including the recent focus on Ashkelon and environs, to specific directives from the headquarters of the Islamic Jihad in Damascus. Israel is prepared for a possible “collapse” in the Palestinian Authority that could render Palestinian leader Mahmud Abbas incapable of imposing law and order, a senior official said Sunday. “We are prepared for a possible collapse in the Palestinian Authority that could risk seeing Mahmud Abbas unable to impose law and order on the ground as well as within his own Fatah party,” the source told AFP. “At this point, Mahmud Abbas is so weak in relation to Hamas that he is unable to implement the smallest decision,” said the official, speaking on condition of anonymity. 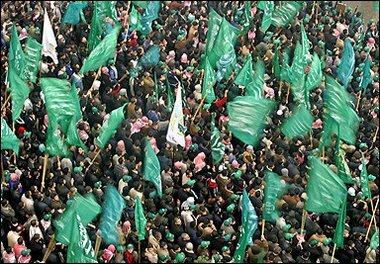 The powerful Islamist movement Hamas is gearing up to contest its first Palestinian parliamentary election on January 25, posing a serious challenge to Fatah’s decade-long grip on power.